I was pleased last week to have the opportunity to attend two events associated with the official rollout of a recent MIT study entitled, "The Future of Nuclear Energy in a Carbon-Constrained World." This was an interdisciplinary study involving a number of people, both at MIT and elsewhere, some as part of the study group, and others as an advisory committee and a team of reviewers. The co-chairs of the study were: David Petti (also the executive director), Jacopo Buongiorno, Michael Corradini, and John Parsons. This study is part of a series of studies that MIT has conducted, starting in 2003, on a variety of energy related subjects, including geothermal power, coal, natural gas, solar power, and the electric grid. 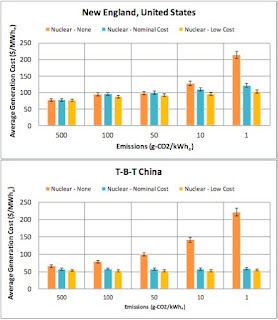 Several of the previous studies dealt with nuclear-power related issues, but this one had the unique twist of focusing on the implications of nuclear energy in a future where there are constraints on carbon generation. 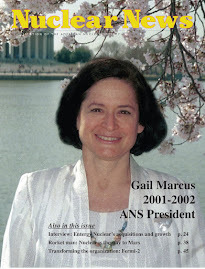 The first meeting of the day was held at the headquarters of the American Association for the Advancement of Science (AAAS), and the second event was a meeting of the MIT Club of Washington, DC. The 2 programs featured most of the same speakers, so I worried that I might be bored by the second round, but that was far from the case. The study provided a very thorough and comprehensive look at the energy supply options under a variety of assumptions, both in the US and around the world, so there was a lot to digest. In fact, having listened to a summary of the study twice, there is still a lot more detail in the very comprehensive report linked above. But if I could highlight one really dramatic visual take-away from the presentations--and the study--it is a graph projecting the likely cost of generating electricity under different levels of carbon restrictions and different assumptions about nuclear power. 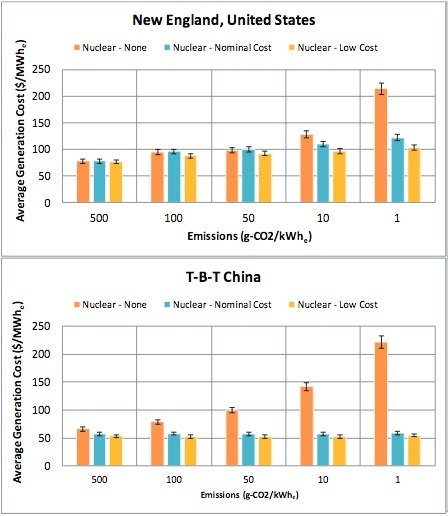 In particular, Figure E.1 in the executive summary, below, shows that the cost of generating electricity is significantly higher for scenarios of very low carbon emissions if nuclear power is not part of the mix, both in the US and in China. The irony is that, the same week that I was attending these briefings, I received multiple messages regarding an initiative of a group in my home state of Maryland who are trying to gather signatures for a letter to the Maryland government urging the government to adopt a low-carbon goal for the future energy supply--but never mentioning the importance of nuclear power in doing so effectively. When I contacted them to ask about this omission, they claimed they were not anti-nuclear, but wanted to avoid a controversial subject. I haven't been able to get my arms around the logic--highlight the problem, but don't mention the one option that is likely to be critical to a realistic solution. It seems to me that this is a recipe for failure in one way or another. And this is graphic evidence that the message about the important role nuclear power needs to play in the future still isn't fully recognized and considered in the ongoing dialogue. So I congratulate the entire team of the MIT study for a job well done, I urge everyone to review the study, and I encourage people around the country--and the world--to share the important findings of the study with their elected officials and others so that we end up with carbon-reduction strategies that are realistic and effective. The Maryland low-carbon goal group has much in common with the Australian government, at all levels. They prattle on endlessly about a low/no carbon future, based solely on wind and solar (there is not enough flowing water in Australia to make hydro meaningful), refuse to even mention nuclear, ignore the escalating costs of electricity - often caused by the cost of turning on diesel generators when the wind doesn't blow/sun doesn't shine (or alternatively too much wind or sun), are silent on the frequent black/brown-outs (which of course dis-proportionally affect the poor/rural folks), etc. Few people know how to think about the high interchange/power transmission costs of no carbon power. The short term result of this indecisiveness was the turnover of the Prime Ministership recently as they agonize over energy policy. It does appear that the world is telling us that nuclear is just not gonna make it. Perhaps it is best to now focus on carbon sequestration and other climate change mitigating technologies, e.g., shading the earth with a big awning, evacuating the Maldives/Florida, jacking up NYC/Amsterdam by say 50 feet, making lots of dry ice, you know easy stuff. Saw a story today about how wind farms, by virtue of their stirring up the air in a fashion different from that of natural wind flows, actually warm the land surface around them by a couple of degrees (F), an ephemeral change to be sure but one which most definitely affects the people who live nearby. There's never a free lunch is there, esp. just when you thought you had one.